Many notebook bag on the market. Only, there are models that look that's all, nothing unique. mostly limited to a bag that also function as a backpack (back pack). However, recently found a notebook bag that is really revolutionary. 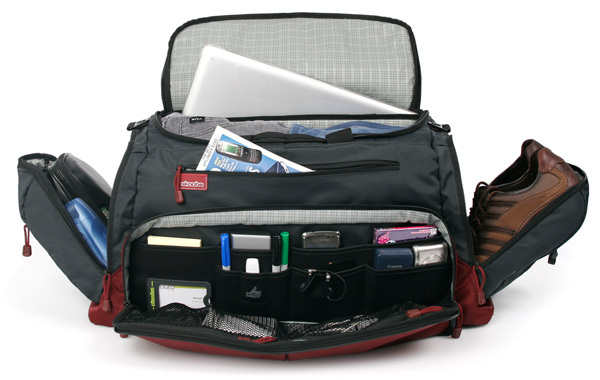 Look at the Weekend Warrior, which is not merely a laptop bag but also multifunctional hybrid travel bag. Skooba bags are made to provide some 'space' for the purpose of your travel, in addition to the slot for the notebook of course. Weekend Warrior provides a place to accommodate the cables notebooks, stationery, cell phone, small notebook, CD box until sepatu. Not less than 24 pocket notebook bag is provided, where there are two large compartments to accommodate your clothes enough to travel for 2 days. Weekend Warrior has a special sleeve at the edge of the bag to put your notebook, measuring 15" or 16". There is also a Weekend Warrior who has a sleeve for notebooks 17", with the excess of his sleeve can be used separately without having to carry his bag. Weekend Warrior notebook bag with a small sleeve sold at a price of $119.95. And, for a large bag with a sleeve with a price of $124.95. Want to know more about this notebook bag, just visit www.skoobadesign.com. Thanks for posting. I really appreciate your work.